About Ruth S. Message Ruth S.
a fun personal tour, with loads of local insight from Ruth. Not only do you get all the Beatle-bits, but you get the Liverpool history and run down from a prideful local who grew up there. Ruth was fun and my whole family loved our afternoon driving around with her, taking photos, and spending as much time as we liked at the locations. Do yourself a favour, book with Ruth, and forget the big bus tours. This was really a great 8 hour tour of Liverpool ! We had about four hours of Beatles related tour, and another four hours touring Liverpool and its many sights. Ruth was really great ! As a local she knows the city really well and gave us a lot of information during the whole day. She uses a nice and spacious van for this tour. We fully recommend Ruth for such Liverpool tours. We travelled from South Africa . Ruth was simply amazing . Her personality , professionalism and knowledge of Liverpool made our family tour very enjoyable . Highly recommended !!! Ruth was fantastic!! She knew all about the Beatles and her lovely city of Liverpool. Having lived on Penny Lane (and seen Paul first hand!) she brought a local touch that you probably don't get elsewhere. Her van was big compared to the other UK vehicles and was clean and inviting. Wonderful, wonderful!!! Wonderful tour with a wonderful guide. Very knowledgeable as well as very personable. My daughter and I enjoyed spending time with Ruth. Would do it again in a heart beat. Our "Beatles" 4 hour tour was very good, our guide Ruth was very good and a real local pro. Liverpool was so much more than we had imagined and besides showing us all the Beatles connected places, she told us a lot of stories and connected these places to the most relevant songs of the Fab Four. And she also showed us that there is much more to Liverpool than just the Beatles and Anfield, that of course was the other reason for our visit to Liverpool. Thanks a lot! Ruth was preoccupied that everything was perfect! She gave us a lot of information and we enjoyed the tour very much! Overall, Ruth was good at what she does. She knows Liverpool very well. She gave us a great tour of the Beatles trail just like we wanted. We recommend her services. absolutley fantastic. Loved everything about it. She Took us to all the Beatles stops and told us all about them and why it was so important. Learned a lot of new stuff I would highly recommend Ruth to everyone I know she was great, waiting at the docks for us always waited for us we never felt rushed she made sure you never missed out on anything it was great. Ruth did an excellent job showing us the Beatle sites we were interested in. We gave her a list of our priority interests and she did the rest. In addition she pointed out city landmarks and interesting info on it. Excellent knowledge of her city. Even though it was raining she was a trooper taking pictures for us. She was very friendly and answered any question we had. Enjoyed it tremendously and would highly recommend her to others. I thoroughly enjoyed my tour! The tour exceeded my expectations in that I didn't expect to see as much as I did. Ruth's enthusiasm and love for Liverpool and the Beatles is amazing! Her personal knowledge and sense of humor made the whole tour exceptional. If I come back for another tour, I will want to see Ruth again! This was the perfect tour for me, a life-long Beatles fan. The guide went well beyond expectations to make sure we saw everything we wanted to, stopped and got out of the car at each site, and that we had great photos to remember it all. She even went out of her way to accommodate our travel plans. Highly recommend!! Ruth was a knowledgeable, friendly guide who gave us a memorable picture of the Beatles and Liverpool. She got us into all kinds of tight spaces so that we could have a close-up view of Liverpool. Her car was comfortable, and she was an excellent driver. We all think that we got our money's worth and enjoyed every minute of the tour. I wanted a relaxed tour with a real Scouser and chose Ruth because her reviews said that she is friendly and fun and happy to vary the itinerary when asked. The reviews are correct. She's also a good timekeeper and a careful driver and is attentive without being pushy, giving you lots of stories about the city in general and the Beatles in particular. I would recommend Ruth to any group, but especially to solo travellers or couples, because she's not just a good guide but good company too. My wife Trish and I were visiting Liverpool for the first time together. Ruth was a bottomless well of Liverpool and Beatle facts (she even met Sir Paul years ago), a great driver, was super flexible and grew up in the same neighborhood that Trish is from. What a magical tour we had together. Won't soon forget it. Thank you Ruth! Ruth was wonderful. She made us feel welcome and as if we were her family visiting from the US. She knew everything about the Beatles and her beautiful home town of Liverpool. We invited her to come visit us next time she was in Arkansas and would be happy to host her. I highly recommend spending anytime you have in Liverpool with Ruth. She made us fall in love with Liverpool - our best guide yet in the British Isles. Ruth gave us a great Beatles tour in Liverpool. We saw John's house, Paul's house, George's house, even Ringo's house! She had some great personal stories that really made the tour special. If you are a Beatles fan this tour is a must. 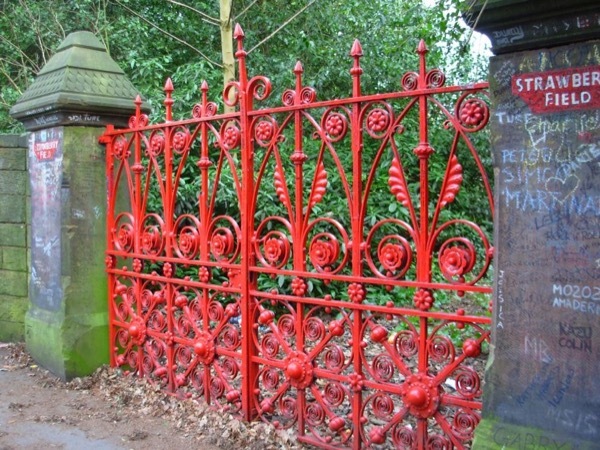 Penny Lane, Strawberry Fields, Eleanor Rigby's grave, the church where John and Paul met and so much more. Wonderful tour and great company. Ruth was a fantastic tour guide! My partner and I got a great four hour "Beatles" tour of Liverpool, by the very personable and knowledgeable Ruth, and we were so glad we booked this time with her. The tour was much more than just about the Beatles - we learned and saw more about Liverpool the city, as well. Ruth is from there, so she knew the city and its history inside and out. She picked us up at our hotel right on time, and we could not have had more fun with her. My highest possible recommendation! Ruth was a fabulous guide! She entertained the whole family, from my 6 year old son to my 67 year old father. She was a wealth of knowledge about The Beatles and the history of Liverpool. We were all very happy with her tour and would recommend her to anyone looking to tour the local area... with a local! Loved the tour with Ruth! So easy - pick up at the hotel and private Beatles tour with lots of other commentary on life in Liverpool. Ruth was a great guide and took us to all the Beatles sites listed in the itinerary except the Cavern Club because we had already been. She was gracious enough to stop at the church where my grandparents were married even though it wasn't on the itinerary so we could look around. I highly recommend Ruth and this tour. Ruth was extremely knowledgeable about all things Beatles ,things you'll never see in the bus tours. She was born and raised on Penny Lane. As a result you will learn things that you never knew about the Beatles as well as Liverpool's expansive growth. Having been a student of the Beatles for decades I learned more then I anticipated.. I HIGHLY recommend Ruth and Tours by Locals. Ruth is an amazing tour guide, who has in-depth knowledge of the history of Liverpool and especially The Beatles (she's a Liverpudlian who grew up on Penny Lane!). I had one day in Liverpool to do background research on a Beatles-related project (I'm in the music business) and Ruth was absolutely incredible, plus she introduced me to one of the original Quarrymen! You won't find a better Beatles' guide in Liverpool...I can't say enough good things about Ruth! My wife and I want to sincerely thank Ruth for the fantastic job she did in showing us all the highlights of the Beatles & the beautiful city of Liverpool. We couldn't of asked for more. She's a fantastic tour guide. We'll most definitely recommend Ruth to family & friends. Someday we'll be back to visit Liverpool & hopefully be able to spend time with her exploring the highlights of Liverpool & area. Thanks Ruth, for making our Liverpool/Beatles experience so memorable and fulfilling. We had a wonderful tour with Ruth. We visited the childhood neighborhoods of the Beatles and also learned a lot of interesting information about the history and architecture of Liverpool. Ruth was engaging and kind. She not only designed the tour according to our wishes, but adjusted it throughout the day when we had a request. Ruth is a great tour guide and very friendly. She showed all the Beatles spots and several Liverpool highlights. We were very pleased with it. Ruth was fantastic! Her home grown knowledge of The Beatles was impressive, plus her ability to relate to our needs was great. Ruth also showed us around the finer points of Liverpool, which helped the rest of our stay. Ruth was an excellent tour guide! She was extremely knowledgeable and friendly. We asked her to show us every Beatles site in the city and she did. She also gave us a tour of the churches and city. She went above and beyond our expectations to give us the best tour of Liverpool. I cannot recommend her highly enough! It will be the best money you spend on a tour with Ruth! Ruth scheduled our tour for 1 pm - 5 pm.She stated that her car was an Audi Q7 fitting 4 adults & 2 children.She showed up in a small Ford. She was very nice but not descriptive enough in the areas we toured.At about 3:00 she started to worry about the traffic at 5 in the port.We invented and sold a product and that started her questioning us continuously about how she could market a product that she wanted to invent. She dropped us off early and that was it. I respectfully request a refund for that day. TOUR GUIDE RESPONSE: I am very sorry my tour did not meet your expectations and has led you to request a refund. I informed you that my car had to go in for a repair when we met and you stated you were happy to proceed in the hired 2017 Ford C-max 7 seater as it had ample room for the two of you. The tour ended 30 minutes early because you requested to go back to the ship as you didn't want to see some highlights of the tour. I take great pride in my city and ensuring all my travellers have the best experience. We enjoyed our day with Ruth very much. We had asked to focus more on Chester, than Liverpool. She gave us everything we wanted in Chester and then opened her heart to us about her hometown, Liverpool. We finished with a mini-Beatles tour including Penny Lane, where she grew up. Touring with Ruth is truly touring with a local! Thank you so much for a fascinating day! Ruth lived in Liverpool all her life and gave us a great tour including her street Penny Lane. Great Beatles tour would highly recommend Ruth. Ruth's Beatles Tour stands out above the rest! We spent a delightful day in Liverpool with this warm, personable, enthusiastic & knowledgeable guide.Ruth took us to all the famous Beatles places and also gave us an overview of surprisingly lovely Liverpool! This tour stands out above the rest because Ruth has a personal connection to Quarry Men band member,Colin Hanton, original drummer of the group, so we met and spoke to him during our tour. Highly recommend Ruth who was born and raised on "Penny Lane"! Ruth was prompt, waiting for us at the pre-arranged time and place. She arrived complete with Beatles masks and a "sunny disposition"! We had an excellent tour of the major places associated with the Beatles. Ruth was very knowledgeable and passionate about the topic of the Beatles and her home city. We had a lot of fun and laughs spending time with Ruth. Her car was clean and in good condition complete with music of the Beatles, and pillows featuring the Beatles. I would definitley recommend Ruth. Ruth tries very hard to make the day an enjoyable one. She was very flexible in putting our tour together, and waiting for us at the British Open. We felt very comfortable with her and enjoyed our shortened Beatles tour so we could attend the Open. Ruth made our visit to Liverpool very memorable with her enthusiastic, knowledgeable and interesting tour and stories of the Beatles and the sites of Liverpool. She was very friendly and flexible, continually asking us if there was anything else we wanted to see. She actually took her own extra time to show us the beautiful Liverpool Cathedral and encouraged us to walk inside. What a bonus! It was spectacular! Ruth's Toyota mini van was very comfortable for our group of four adults. Best tour! We had a a great tour. Fun and interesting. Ruth was fantastic!! We had such a great time!! We highly recommend this guide! Ruth was everything we expected from a knowledgeable tour and then some. Her personal touch and life experience were an added bonus over a tour bus excursion. We highly recommend touring with Ruth. Ruth gave us a great tour of Liverpool and all things related to the Beatles. She went out of her way to include all of our main interests and gave us extra time at the locations that meant the most for us. I highly recommend her as a guide. We had a great time with Ruth! She was fantastic and fun and knew all about the great city of Liverpool. We will be recomending her to all our friends. GREAT tour of Beatles and Liverpool maritime sites on 13 October. Thank you, Ruth H.!!! Ruth was great. Knowledgeable and funny. She knew everything about Liverpool and the Beatles plus she was warm and delightful. We enjoyed her tour tremendously! We decided that we didn't want to travel to Chester when she met us. Ruth did a Beatles tour and city tour instead and we really enjoyed the day. I highly recommend Ruth as a guide ! We booked several private tours during our cruise of the British Isles. This was the best! Ruth was personable, knowledgeable, and lots of fun. She took us to everything we wanted to see in Chester, as well as the Beatle tour. I would highly recommend her for either of these tours. Ruth is amazing! I would always request her. Ruth provided an excellent tour for the Beatles and of Liverpool!. She is polite and has a great personality which makes the tour go by very quickly. She provides great background that only a native of Liverpool can provide!Highly recommend Ruth if you want to have a great tour! We had a great day with Ruth in Liverpool. Se was very entertaining and excellent storyteller. Ruth was a great guide and lots of fun! You can tell she really loves her city and sharing it with others. Ruth provided a fabulous personalised tour, taking my parents to the areas they grew up in as well as showing us the highlights of this beautiful city. She was personal, funny and full of love and information for her city. Ruth was fun. She took us around Liverpool in the morning and then into Chester in the afternoon. Her knowledge of the area was great. She knew made good recommendations for lunch and sights to see. We enjoyed our day in Liverpool and Chester with Ruth. Highly recommend. Ruth was a great tour guide and showed us the best of what Chester and Liverpool has to offer. She was friendly, knowledgeable, and patient with us. Would recommend highly. Thanks so much! Perfect tour: personalized as requested. Ruth is THE BEST!!!!!!!!!! She was not only completely accommodating and went the extra mile to ensure we had the best Liverpool experience but also made us feel as if we were being shown the city by a friend, not only a guide. A completely new experience. We really enjoyed our day with Ruth! She was very interesting, warm and knowledgeable about Liverpool and surrounding areas we visited. The experience was most rewarding and enjoyable! Ruth gave my sister and me a wonderful tour of the Lake District and also showed us the highlights of Liverpool. Her great pride of her city is very evident. By the end of the tour, we felt like we had found a new friend. The four of us just loved Ruth Taylor. A native from Penny Lane had many stories and sights to share with us about Liverpool and the Beatles then and now. Her Beatles tour took us to the Cavern where the Beatles began to Ringo Starr's childhood neighborhood. Please note that her car was a typical SUV that will comfortable sit only three adults. If you are extremely slim, you can fit three in the rear. If you are a Beatles fan, Ruth is your best bet!! She has lived and breathed the Beatles. She is also very knowledgeable about Liverpool in general. She made our day in Liverpool most memorable!! Thanks Ruth! TOUR GUIDE RESPONSE: Thank you for you feedback , it was a pleasure to have met you all , really pleased you all enjoyed your day . To say we had a memorable day with Ruth is a gross understatement. Ruth picked us up at our hotel right on time with a smile and wonderful disposition. Ruth's knowledge and expertise of the 'Beatles Tour' we contracted for was exceptional. We saw everything we wanted to experience and then some. Her newer model car was very comfortable for us as well, especially for me being 6' 4" tall. During the day we changed up a few things from our original itinerary and this was absolutely no problem for Ruth!! Ruth is a wonderful lady with vast knowledge of her hometown of Liverpool and The Beatles. She was very accommodating and took us to see everything on our list and more that even this Beatle fanatic didn't know about! Very comfortable car . Would highly recommend a tour with Ruth, you will not be disappointed. We feel we've made a new friend. Our guide Ruth did an excellent job in taking us though Liverpool! Our tour began with a walk through the city to see the White Star Line (The Titanic) headquarters, now a beautiful hotel. We went to The Cavern, where the Beatles began. Then we drove around and saw many historical sites. Ruth was very charming, nice, and very knowledgeable! We would greatly recommend Ruth to anyone visiting Liverpool! TOUR GUIDE RESPONSE: think you for kind comments !! It was a real pleasure to meet you all !! Really pleased you enjoyed your day !! Hope you enjoyed the rest of your cruise !! Our tour with Ruth was part of a 12 day cruise to the British Isles and without a doubt this day was one of our greatest memories. Ruth grew up on Penney Lane and the stories she shared with the four of us who grew up with the Beatles were so much fun. Our day was simply delightful. We even got to see the "Yellow Submarine." We ended our Beatles tour at the Albert Docks and even got to see the "Giants". We cannot say enough about Ruth and Tours by Locals. The Jones and the Nixons. Wow- what a great Beatles tour! I especially liked how Ruth provided the background history which made the later "Beatle moments" more meaningful. Excellent knowledge of the subject and very friendly. Highly recommended - no kidding folks. TOUR GUIDE RESPONSE: Really pleased you enjoyed the tour !! It was great to meet you and hope you can make it back in the future , lots more for you to see !! Ruth is absolutely the best private guide you'll ever have. She knows the Beatle history and truly takes you on a Magical Mystery tour of Liverpool. My wife and I enjoyed every minute with Ruth because besides being a great guide she is a wonderful caring person and will tailor your tour based on your particular interests. 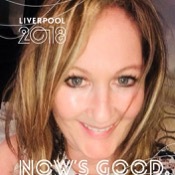 If you're looking for a personal guide of Liverpool you can't go wrong booking a tour with Ruth H.
TOUR GUIDE RESPONSE: Thank you for lovely comments !! Really pleased you both enjoyed & left with great memories !! It was a real pleasure to meet you both !! Ruth was a very attentive guide. She made sure we were all happy and got to see everything. Ruth made the trip. TOUR GUIDE RESPONSE: So pleased you all enjoyed !! it was a pleasure meeting you all . TOUR GUIDE RESPONSE: Thank you for your kind comments i really enjoyed meeting you all and really pleased you enjoyed your tour & time in our great city !! I look forward to hopefuly seeing you all again in the future. We really enjoyed our time with Ruth. She's a true fan of Liverpool and made us feel as if we had a personal friend there. Had some great Beatles moments, seeing things I never thought I'd see and hearing her stories about those things. It was a great experience. There are places I'll remember - and Liverpool and Ruth are two of them!! !